My first creation of the new year, a pair of earrings. The lovely polymer clay feat hers were made by artist Nicole St Laurent aka Raven’s Meadow. 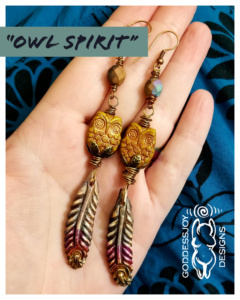 I accented them with some Czech glass owls, faceted rounds, and brass bead caps from gr8beads.com. I’m really in love with this ochre yellow color right now, which isn’t my normal color choice. New year, new favorites? We’ll see if it sticks around through spring. For now, these earrings will be sticking around, since I’ve decided to keep them for myself.